Before you know it, it will be tomato season. We have some in our greenhouse! 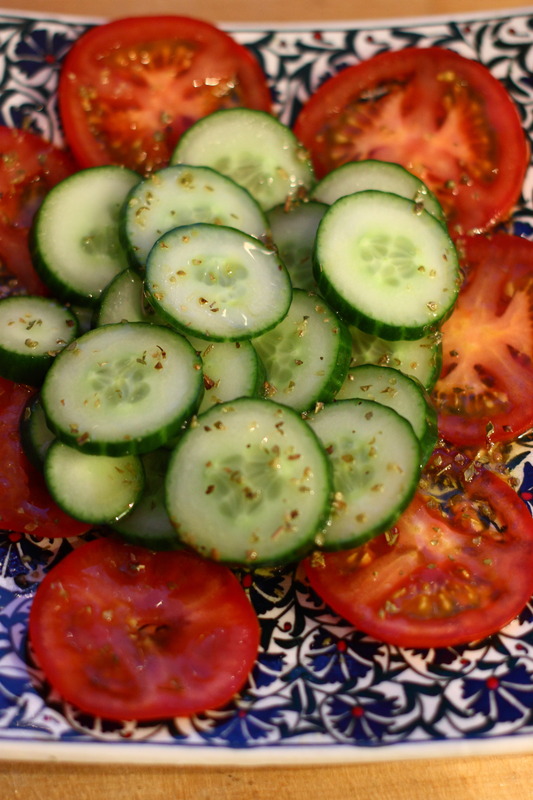 There’s nothing quite as fresh and tasty as a tomato and cucumber salad. It’s especially good when served with a handful of toasted seeds (not shown in this picture) on top and a wine vinegar dressing. Crunchy, fresh, sharp. Toast the seeds in a dry pan until they turn golden brown. Make the dressing with the oil, vinegar, oregano, salt and pepper. Toss the tomato and cucumber with the dressing and serve topped with the seeds. This entry was posted in Easy mid-week meals, Family friendly, Salad, Vegetarian and tagged Family friendly, Quick supper, salad by theclaremontroadkitchen. Bookmark the permalink.